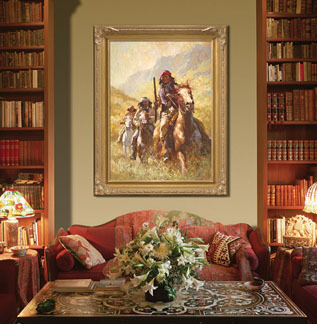 Howard Terpning is one of the most lauded painters of Western art. 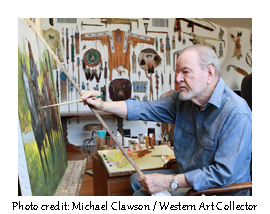 Over his lifetime he’s received the highest awards in the field, including the National Academy of Western Art’s Prix de West, the Hubbard Art Award for Excellence, the Lifetime Achievement Award from the Autry National Center, and 2005 Masters of the American West Thomas Moran Memorial Award and countless others. He’s an Emeritus member of the Cowboy Artists of America with over forty-one awards from that organization alone. Quite simply, he’s a living master of Western art. Items from Terpning’s own extensive collection of Indian artifacts often appear in his paintings. His historical accuracy and technical prowess form the firm foundation for his style, earning respect from fellow artists, collectors and the native peoples he depicts. Original Howard Terpning oil paintings now command top prices at Western auctions. Search for the Renegades, an oil from 1981, recently sold for $1.5 million dollars. Limited edition giclees and lithographs by Terpning often sell out at the publisher as soon as they're released.